Woohoo! I was very VERY excited indeed when Debbi Tehrani invited me to be a Special Investigator for CSI this month! I'm still pinching myself - it really is a huge thrill to see my pages featured alongside the amazing work done by the CSI Detectives (design team). 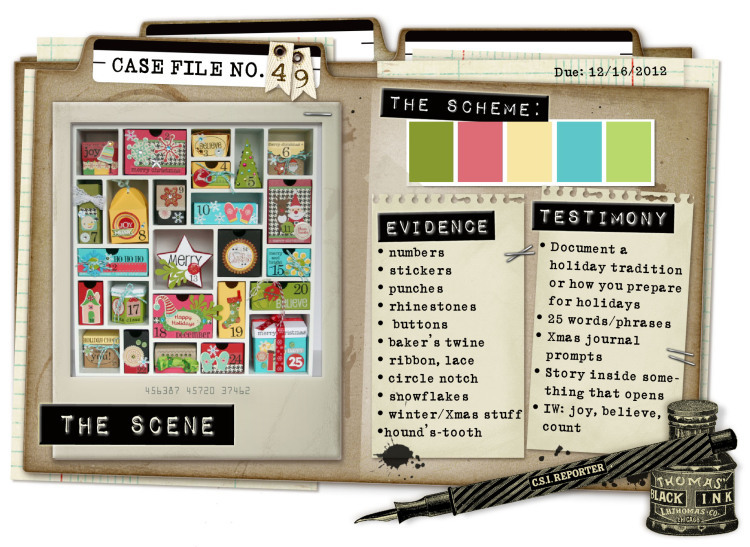 Have a look at the Big Reveal for Case File #49 to see for yourself - if you've not checked out CSI before, I promise you'll be impressed and inspired. 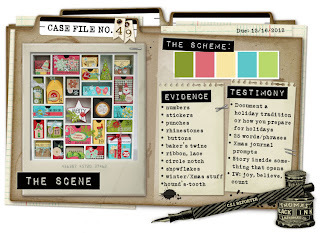 For each Case File, Michele Singh creates a set of CSI Coordinates - these are gorgeous free printables which you can download as a PDF, save to your pooter and print off to use as you like (digi scrappers also do amazing stuff with them). They are brilliant and always include some little accent images, some journalling spots and some background pp - FAB! "One of the new skills we had to learn for our DIY wedding day was floristry - a real challenge! The large flower is one of 65 which I crocheted for the ladies' favour bags, the rhinestones were some of those which we sprinkled on the tables, one of the buttonhole pins is tucked in above the photo and there is some of the glittered organza ribbon from my bouquet attached to the crochet flower - I love how scrapping gives you a way to use all these bits and bobs you don't want to throw away! ps I also had to undergo an Interrogation and provide an ID photo - here's my Special Investigator Profile on CSI - cringing a bit looking at it now to be honest - I just waffled on for far too long (nothing new there) and didn't even remember to say thank you! How rude! Ok I'm off to start investigating Case File #50 now ... sssshhhhh!